A funny thing happened to you on the way to the dentist. Now, there’s an open mic coming up, and you will get 5 minutes to entertain the masses. What do you need to do to get your dentist-commute-story from its current state, as a brief anecdote, to a meaty 5-minute affair that will make an audience chuckle and learn a little something about the human condition? Strap in, readers. It’s going to be a bumpy ride. WINTER OLYMPIC NEWS HOOK: Here’s my own anecdote-turned-story of mine about gold medal figure skater Tara Lipinski! 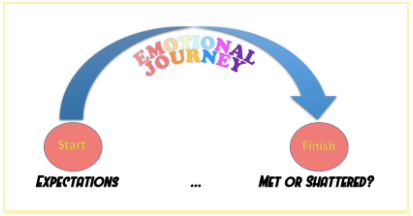 The main goal here is going to be: Find the emotional journey. Every good story has an arc. You begin one place, and you end up somewhere else. How do you feel at the beginning of your story? What expectations do you have? Where do you find yourself at the end in terms of emotional state? What expectations have been met or shattered? What choices did you make in the process? That’s the beginning and end of your story. Here, I made a picture, because I just figured out Word Art. Your story, after its beginning, will have a moment when everything changes. Perhaps it was the moment when your usual route to the dentist was blocked because of road construction. And that was the moment you knew that this would not be your average dentist commute! Side note: Why have I chosen such seemingly boring subject matter for our jumping-off point? Because I want to illustrate that stories can pop up anywhere. The real question is: What makes this day different? Good stories focus on crossroads in people’s lives. Any good scene, story, or joke exists in the moment when the usual becomes the unusual. Otherwise, why would you pick that moment? Maybe you just got a bad grade and are feeling especially down, and your friend has strep throat and canceled her birthday party that you were so excited about, and it’s hailing outside, and now you have to go to the dentist to deal with a cavity. You are at your wit’s end! One more bad thing and you’ll explode! So that’s how we know today is different. We find you at a breaking point. A good story often begins with a character either on the brink of changing or learning, but not yet sure how she will, or a character completely oblivious to change, who is, therefore, gobsmacked by it. Desire + obstacle = conflict. In shaping your anecdote into a story, consider what you, as a character, desire in this story. Is your desire to NOT be going to the dentist? Are you ruminating about a love interest as you walk the last few blocks there? What do you want, and what are the obstacles in your way? These obstacles come in different shapes and sizes. They are both internal and external. Okay, now is the moment of transformation for your little anecdote. Set yourself up for success by conveying your state of mind and what you want at the beginning of the story. Identify your turning point, that moment when everything changes. By the middle of the story, we will expect to find you, our protagonist, facing one or numerous obstacles in pursuit of what you want. By the end, you’ve either gotten what you wanted or haven’t, but in the wanting of it, you are now changed in some way. Articulate that change at the end of your story. “The end is in the beginning.” You will hear this in improv classes when it comes time to end a scene on a laugh line, you might have heard it in algebra class, and you’ll hear it right now in this article about morphing anecdotes into stories. Compare your ending to the beginning of your story. How do you, as a character, now feel? Without the beginning, your ending packs no punch. Plant the seeds of what might be your next story at the end of this one. Not because you are definitely going to write Commute to the Dentist 2: Electric Boogaloo, but because it ends us on a note of curiosity and intrigue. BUM-bum-bum. BONUS STORY: Here’s another about how I had ghosts in my room as a kid and my mom helped to get rid of them. Speaking of curiosity and intrigue: What’s YOUR story about? I wanna hear it! Tweet us at @GoldComedy!